Mezzo-soprano Sharon Carty [...] displaying clean vocal ease and expression in Gluck’s sweet lyrical lines. In Act III she is uncannily matched in sound for her long-awaited exchanges with the rescued Euridice, soprano Sarah Power. The soprano parts were sung by Sarah Power. Sarah’s voice is effortlessly lovely, pure and clear. She captivated the audience. Power’s Redeemer Liveth provided, to me, one of the best arias of the evening. Sarah Power, soprano, delivered beautiful and sensitive renderings of How beautiful are the feet, and I know that my Redeemer liveth and, in contrast, a lively and exciting Rejoice Greatly with clearly articulated semiquavers. Sarah’s apparent ease of performance, her crystal clear voice coupled with her obvious joy of singing the part both charmed and held the audience enraptured each time she rose to sing. Among the highlights were the soprano soloist Sarah Power in ‘Rejoice’, sung as if she were rejoicing, with good breath control, and producing beauty in ‘How Beautiful are the Feet’. In the cast of 32 there are some stand-out performances which bode well for the future of opera in Scotland. Previous Scottish Opera Emerging Artists Andrew McTaggart and Sarah Power’s experience clearly shows, both delivering strong vocal performances as Caligari / Gallagher and Jane. But it was the soprano Sarah Power who made the deepest impression. She possesses an easeful, limpid voice that made How beautiful are the feet utterly memorable. Sarah Power, soprano, sang with beauty and ease, her entrancing tones delicately filling the huge nave. Miss Power gave beautiful performances of the arias 'How beautiful are the feet' and 'I know that my redeemer liveth'. The soloists were excellent. Sarah Power, with the appearance of a maiden in a Pre-Raphaelite painting, deployed her lyric soprano to great effect, communicating her fervour directly to the audience. Two [soloists] deserve special mention. Sarah Power's [...] Let the Bright Seraphim, the oratorio's most famous aria, was excellent. Young Irish soprano Sarah Power in the title role captures both the strength and fragility of Rodelinda and her superb clear soprano rang out from the stage. There’s some beautiful singing from Sarah Power as Rodelinda: the Irish soprano has an easy, natural voice and an unfussy stage presence to match. Irish soprano Sarah Power, as flame-haired as the publicity shots suggested, relished the central role and sang with a beautifully pure voice ... At the heart of the opera there was the exquisite duet between Rodelinda and Bertarido, soprano and counter-tenor voices inter-twining – the musical highlight of the evening. It was a staggering performance … the audience left feeling distinctly elated after witnessing a really great musical experience … the soloists were superb in every way … their vocal technique and intonation were flawless and their acting ability quite breath taking. Sarah Power’s Rodelinda, sung with a glowing youthfulness … her duet with Andrew Radley as Bertarido (I Embrace You) is as moving as the heart of this opera should be. Sarah Power's Rodelinda, reminiscent of a pre-Raphaelite redhead, used her bright, personable soprano with unfailing taste and technical ease - supremely so in her mesmeric Act 3 aria of despair, a fitting climax to the whole performance. Atalanta was sung by the soprano Sarah Power, who projected warmth of character and bright vocal tone, and who exuded energy and competence as the boar-slaying princess ... The two Atalanta-Meleagro duets were delightful. ... a tonal quality that seemed perfect for Bach. Sarah Power’s singing of this movement was particularly beautiful, enhanced – if one may say so – by the touching expressiveness of her lovely face. I know that my Redeemer liveth ... was exquisitely sung. There were overwhelming moments ... Sarah’s technique - with personality - in Gounod’s Ah! Je veux vivre was sensational. The Dublin-born singer always engaged the listener. Daniel Joy convinces with a powerful tenor and Sarah Power with a beautiful soprano voice. Dabei überzeugt Daniel Joy mit einem kräftigen Tenor und Sarah Power mit einem schönen Sopran. Above all, Sarah Power captivates and lights up the evening. This russet-haired Irish girl with translucent skin and luxuriant tresses possesses a very assured technique. She corresponds ideally to a young Gilda, elevated by the purity, the freshness and the honeyed tones of a naturally beautiful voice with pianissimos to die for. [Her] astounding agility and mature resolve ensure a wonderful end [to the evening]. Et en tout premier lieu, Sarah Power enchante et illumine la soirée. Cette Irlandaise rousse à la peau diaphane et à la chevelure abondante possède une technique très sûre. Elle correspond idéalement à une Gilda juvénile magnifiée par la pureté, la fraîcheur et le miel d’une voix naturellement belle aux pianissimos à se pâmer. L’agilité stupéfiante et la détermination toute en maturité font également merveille dans la dernière partie. All of the soloists were excellent but the palm should go to soprano Sarah Power for her heavenly radiance in the recitatives and air, Rejoice greatly. The women form a fine quartet, from which stands out the fresh and spicy Nanetta Sarah Power, exquisite Queen of the Fairies. Les commères forment un beau quatuor, dont se détachent la Nannetta fraîche et piquante de Sarah Power, exquise reine des fées. The Irish soprano Sarah Power gave a radiant, word-lively recital of Bellini, Stravinsky, Poulenc, Martin and Strauss ... Her sheer full-hearted exuberance of communication doubtless won the jury’s heart. A spectacular performance by the other Irish soprano, Sarah Power, of the final scene of “La Sonnambula”. After a lambent Andante her Amina woke up in no uncertain terms, scaling the heights as she headed back towards the reprise of “Ah non giunge” and avoiding any hint of shrillness. It deserved to be acclaimed. The final artist of the evening was soprano Sarah Power. For me ... she was by some way the most promising artist with a large but agile voice and excellent platform presence. Opening with Ginevra's “Volate, amori” from Act 1 of Ariodante she gave a pretty much faultless performance ... For her second aria she gave Morgana's “Credete al mio dolore” from Act 2 of Alcina ... with some breathtakingly beautiful singing. Sarah Power's fresh, clear soprano was meticulously placed in the Pie Jesu. Both John Molloy as the priest and Sarah Power as Alison thoroughly enjoyed playing out their antics and possess beautiful, promising voices. 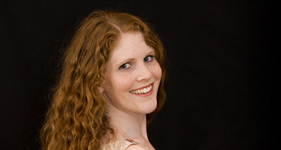 ... partnered by Sarah Power, whose flowing, unforced singing of Susanna's 'Deh vieni' gave much pleasure. I liked the action-girl Pamina, dressed in T-shirt and shorts, finely sung by Sarah Power and acted with commitment; her aria ‘Ach, ich fuhl’s’ was an expressive musical peak. Sarah Power ... sang beautifully, and with considerable animation, touching the heart as well as stiffening the sinews, and she is assured great success in the future.